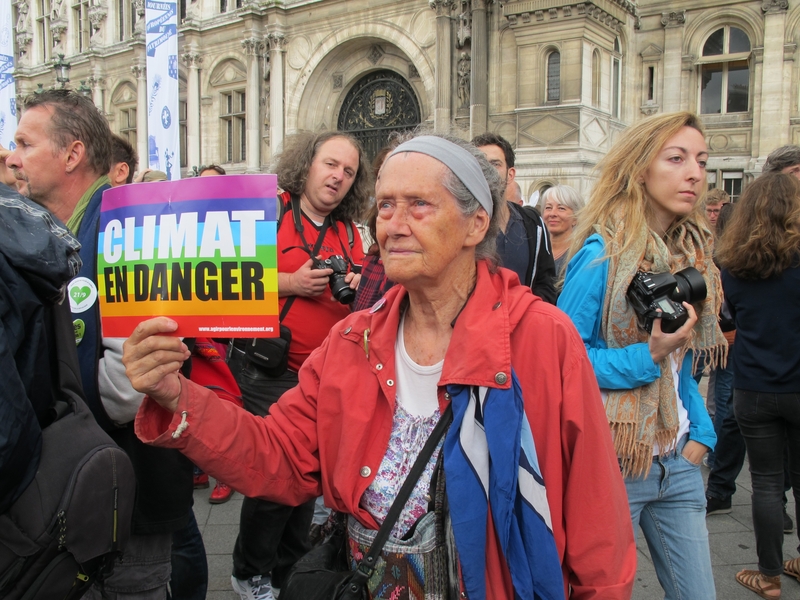 PARIS, Sep 21 2014 (IPS) - As if to highlight the reality of climate change, the rain came pouring down here as demonstrators prepared to rally for political action to combat global warming. But as the march got under way from Paris’ historic Place de la Republique, bright sunshine broke from behind the ominous clouds, giving a boost to the several thousand people who had heeded the call to send a message to world leaders. The Paris march was one of 2,500 events that took place around the world Sunday, involving 158 countries, according to Avaaz, the international civic organisation that coordinated the “People’s Climate March” in Paris. French cities Lyon, Marseille and Bordeaux also held marches. The demonstrations came two days ahead of the United Nations Climate Change Summit scheduled for Tuesday, when world leaders will gather in New York to discuss the wide-ranging effects of global warming, including ocean acidification, extreme weather conditions and rising sea levels. “The leaders can’t ignore this massive call for action,” said Marie Yared, an Avaaz global campaigner in Paris. “The message is much stronger now because we’re seeing people in all their diversity making their voices heard. It’s not just activists. To reflect the global concern, the rallying cry at the march was: “To change everything, we need everyone (Pour tout changer, il faut tout le monde).” The diversity of those taking part was notable, with demonstrators including senior citizens, students, children, non-governmental organisations, union members and religious groups. They chanted, beat drums, danced and carried large banners as well as self-made drawings and signs. Other demonstrators met the marchers as the rally moved to the square in front of the city’s town hall. The largest French Protestant organization, the Fédération Protestante de France, had urged its members to participate in the movement, saying “it’s time to change the course of things”. “From New York to Berlin, from Bogota to New Delhi, from Paris to Melbourne, thousands of people are marching together to make their voices heard and to remind heads of state that the climate issue is universal, urgent and affects ecosystems and the future of mankind,” the Federation stated. Joining in were farmers organisations, Oxfam France, Action Contre la Faim (Action Against Hunger), Catholic groups and others who wanted to draw attention to the less obvious consequences of global warming, which also affects food security and has created “climate refugees”. 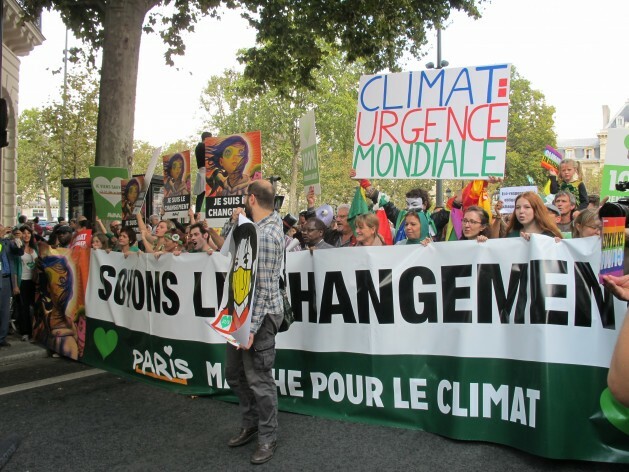 The Left Front was one of the political parties, including Europe Ecologie Les Verts (Greens) and Jeunes Socialistes (Young Socialists), that was out in support as well, with members handing out leaflets bearing the slogan: “We must change the system, not the climate”. Participating groups stressed that France has a crucial role to play because Paris will be the host city of the 2015 UN Climate Change Conference (COP 21) where binding agreements are expected to be made on reducing carbon emissions. “People need to stay alert and to keep the politicians awake until we see what happens next year in Paris,” Yared of Avaaz told IPS. Some rights organisations that did not take part in the march are planning their own events to put pressure on politicians to act. Amnesty International is launching a campaign on Sep. 23 titled “Faites Pas l’Autruche (Don’t be an ostrich, don’t ignore what’s going on) to highlight the lack of laws governing multinational companies whose local subsidiaries may cause human rights violations. The group wants French lawmakers to enact a law that will hold companies to account, an Amnesty spokesperson told IPS, citing incidents such as oil pollution in Nigeria and the dumping of toxic waste in Cote d’Ivoire. The group said that victims of corporate malfeasance should have recourse to French law and courts, wherever they happen to live. To raise public awareness, Amnesty will hold demonstrations at political landmarks in Paris, such as at the Assemblée Nationale, the seat of parliament, on the day that leaders meet in New York.